Apples of Gold presents a white gold cross pendant that brings twice the beauty to your jewelry collection. The 14K white gold is the perfect precious metal to convey a modern flair to this cross pendant. This piece features a standard cross shape, but with each arm slightly flared for a subtly dramatic effect. The gold cross pendant is plain of any carvings, except the silhouette of a cross that is carved into the pendant. This unique design element offers a different take on the standard cross pendant. The entire piece is polished for a lustrous, smooth shine. 27.5mm x 18mm (1" x 3/4"). 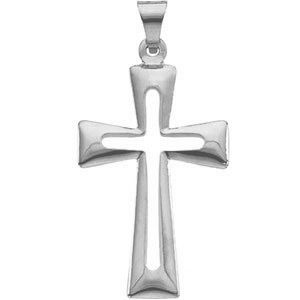 We guarantee our Cut-Out Latin Cross Pendant 14K White Gold to be high quality, authentic jewelry, as described above.